Parents, regardless of what you or our Safeway instructors say, your teen driver will drive like you drive. The problem is, they don’t have years of experience in handling a vehicle, like you do. Starting today, it is important to be a positive role model at all times. Become a “by-the-book” driver and your teen will become one, too. Good news: Our students tell us overwhelmingly that their parents are safe drivers. Texting. 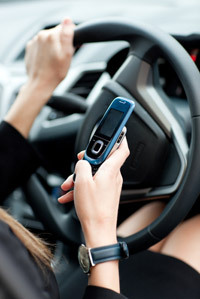 Many people still have not heard that it is illegal and dangerous to read or write a text message. Teens have shared with us that their parents give the excuse that it is “for work.” Work or not, you are 23 times more likely to crash while texting. Knock it off! Speeding. With freeway traffic going 60-65 mph in 55 mph speed zones, it is difficult not to get on the bandwagon. But when your teen is present, don’t speed! They need to know it is okay to be in the right-hand lane and to be passed by other cars. A 15 minute freeway drive at 62 mph saves less than 2 minutes if driven at 55 mph. Never, ever, speed on residential streets with speed limits of 25, 35 or 45. Doors open, pedestrians cross traffic, cars pull out of driveways, cars stop suddenly. Teens just can’t see and react as you do, but they will go as fast as you do. Changing Lanes and Turning. With light traffic and no following car, who would even see your turn signal indicating a lane change? Nobody. But your teen needs to develop the habit of a quick check over the shoulder, a turn signal, a check in the mirrors and one last check over the shoulder before changing lanes. If they don’t develop the habit for every lane change, they won’t do it instinctively when they really have to – in fast-moving, crowded traffic. Same with turns. Get in the habit yourself! Racing Yellow Lights. This is an epidemic in Minnesota and you see violators every time you drive, every day. Know when a green light goes “stale”, anticipate the yellow light and stop if the light turns yellow (check your mirror for tailgaters). Rolling Stops. Although rolling a stop may be tempting sometimes, a stop sign means stop. It is another important habit for your teen to develop. Teens need to stop first (Task #1), then look and decide (Task #2). So do you. Tailgating. Talk about risky, aggravating behavior that accomplishes nothing. Back off, take a deep breath and wait for a safe opportunity to get around a slower driver. Teens need a safe following distance of 3-5 seconds to identify risks and decide what to do. Plus, tailgating provokes road rage, and new teen drivers are easy marks for jerks looking for revenge. Seatbelts. The number of parents who don’t wear seatbelts has gone way down over the years. If you are one of the few who still doesn’t get it, wise up! The 8% of Minnesota drivers who don’t wear seatbelts represent over 50% of traffic fatalities. Don’t be an idiot. Finally, you may want to refresh yourself on the laws by reading the Minnesota Driver’s Manual. If you aren’t already, it is time to be a “by the book” driver.